Separating from your spouse is rarely an easy, clean or happy process. A divorce can be drawn out for months as the lawyers argue each side’s case for possession of assets and the payment of maintenance. An annulment often seems like a simpler, hassle-free approach to separating – but what exactly is the difference? 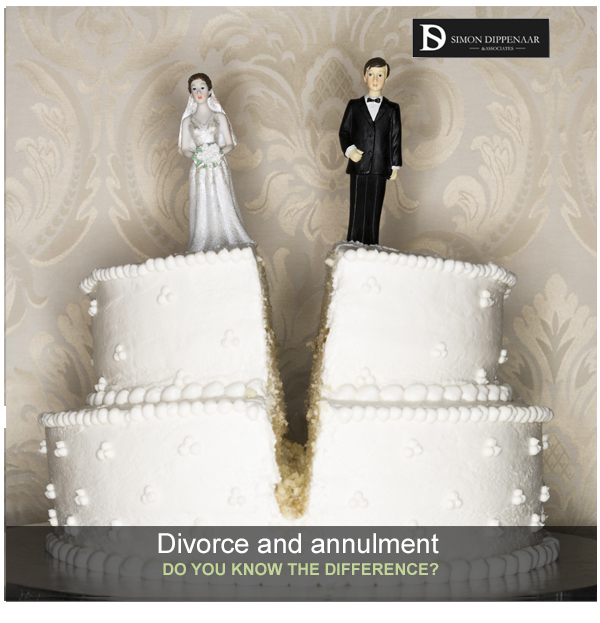 Divorce – dissolves the marriage and separates the joint assets between the couple. Annulment – voids the marriage and changes the records to show no trace of it legally. However, there are several considerations that the court take when looking at annulment or divorce applications. Anyone wishing to end their marriage can apply for a divorce. On the other hand, annulment is only an option in certain circumstances as set out by the Marriage Act of 1961.
Who can apply for an annulment? Unions between those who are underage or have been declared mentally insane at the time of the marriage. Marriages that were entered into under fraudulent conditions by one of the couple. Ceremonies that were conducted by someone who isn’t recognised under South African law as being able to preside over a wedding. When talking about annulments, two types of marriages will come up – void and voidable. Both of these types will be considered by the courts for annulment. A void marriage is one that was never actually legal to begin with. Under South African law, cases include marriages where one partner is already married – aside from some traditional polygamous marriages that are allowed. Other instances included underage marriages without parental consent or incestuous couples. Essentially, with a void marriage, you don’t need to get a formal declaration of annulment as the marriage was never recognised legally. However, people do like to get the piece of paper from the courts in order to avoid possible legal ramifications in the future. The definition of a voidable marriage is a little bit more complex. These are marriages that are legal but there was a form of misrepresentation, fraud or intimidation by one of the couple at the time of the wedding. In these cases, a hearing must be held in front of a judge and a ruling will then be given. What should you do in your situation? South African law is quite specific on what grounds constitute an annulment and on who should be granted one. However, it can be quite tricky to work out if your particular situation fits the criteria. Simon Dippenaar & Associates are experts in family law. Speak to Simon today about whether or not you can apply for an annulment, or if divorce is the right option for you. This entry was posted in Divorce and Annulment and tagged annulment, divorce and annulment. Bookmark the permalink.